After the Lions comes the Ashes, as Anglo-Australian sporting rivalries move smoothly across sports and hemispheres. The transition brings to mind one man. It would be distinction enough merely to be the only man to have played for the Lions and in Ashes Tests. Andrew Stoddart took it a step further, captaining both the pioneering 1888 Lions - taking over when original leader Bob Seddon was drowned - and England's cricketers on two tours of Australia. Stoddart's fame as a cricketer has to some extent overshadowed his rugby career. Yet as much as his relative achievements in the two games, this reflects cricket's greater literary traditions and respect for its own history. Stoddart himself was known to say that 'football is my game'. It was, as might be expected, the game in which this son of a prosperous South Shields businessman who had moved to London during his childhood, first made a mark. He joined Harlequins as a 14-year-old and his youthful promise was such that he was lured to join Blackheath, 'controversially and to the chagrin of the Quins'. In 1882 it was a move that made sense. Blackheath were not only England's leading club, but at the cutting edge of the game's tactical development, with players like half-back Alan Rotherham and centre Harry Vassall developing a passing game calculated to aid a bright young threequarter like Stoddart. The newcomer had undoubted charisma. Albert Kinross, who played cricket against him, recalled that "there was something of the Greek god about Stoddart. Any artist would have jumped at him as a model". And he had serious talent as well. A contemporary account spoke of "the quickness with which he can swerve and dodge without losing way when dodging an opponent, his extraordinary starts and jumps, the certainty of his fielding and his mastery of all the tactics of attack". That livewire quality made him consistently Blackheath's leading scorer and inevitably brought him to the attention of England's selectors, winning his first cap against Wales in 1886 in a three-man threequarter line alongside the prodigious Australian Charles Gregory Wade and Rawson Robertshaw, the first centre to make a mark as a distributor. A final total of 10 England caps over eight seasons might be taken to imply an underachieving international career. 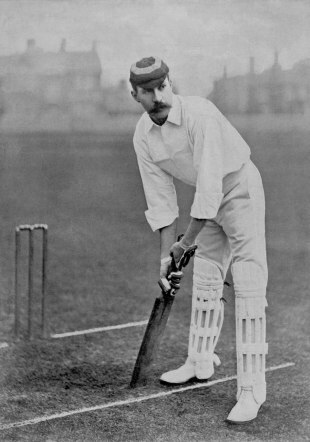 But in an era of fixture-cancelling disputes, England did not play another home nation in 1888 or 1889, and his career was also interrupted by injuries, cricket tours and the calls of business. Arthur Budd, an acute and informed critic, wrote that he was 'regarded as the wing threequarter during the middle and latter part of the decade'. Anecdote attached itself to him. There was the time when he dived into a deep pool in the in-goal area to claim a try and the moment when, handed the ball on his international debut, he landed a decisive long-distance goal from the mark. That swerving, dodging style levied a price in two 'debaggings' while on national service - against Wales in 1886 and then memorably and controversially in England's sole match of 1888 against the touring New Zealand Natives. Natives player Tom Ellison recalled that he wriggled out of a tackle but "left a part of his knickers in my possession. He dashed along and the crowd roared, then suddenly discovering what was the matter he stopped, threw down the ball and, in an instant, we had the vulgar gaze shut off by forming the usual ring around him". The controversy arose because, while the tourists were guarding Stoddart's gentlemanly modesty, England forward Frank Evershed grabbed the ball and scored a try. The rumblings from the touring team's furious reaction echoed through the rest of a long tour. Long tours was something Stoddart knew plenty about. He had not long returned from 14 months in Australia - first on the cricket tour which brought him his first England cap, then with those pioneering Lions. "His end was desperately sad. Worried by poor health, deteriorating finances and a joyless home life, he shot himself on April 3, 1915"
He was also the first captain of the Barbarians, but may have had mixed feelings about the role. It fell to him to make the losing captain's speech on three of the four times he led England, including historic defeats by Wales in 1890 and 1893. He did not handle the loss at Dewsbury in 1890, Wales's first win over England, with particular grace, complaining that the pitch was unfit and earning public rebukes from both the president of the Yorkshire Rugby Union and the secretary of the WRU. There are also hints that his attacking brilliance was not matched by defensive qualities. Possibly irked by the slight on local conditions, the Dewsbury Chronicle accused him of 'funk' in the Wales match while team-mate Sammy Woods recalled his being 'a little too gentle' in his final appearance against Scotland in 1893. That was also his last year in senior rugby, by which time, as Budd wrote, his feats in the two sports had 'earned for himself a fame that has fallen to the lot of no other man'. While his rugby career was over, there was plenty more to come from the cricketer, although his most famous single feat - an innings of 485 for Hampstead against the Stoics, then the highest in any class of the game - was already behind him. Already a veteran of two tours to Australia he was to go on two more, as organiser and captain of the England teams of 1894-5 and 1897-8. While the second of those tours was an unhappy failure, with Stoddart prostrated by grief mid-series by the death of his mother, the first has gone into cricketing legend. It was, Frith has written, "surrounded by intense publicity and played with almost unnerving sincerity, marking the commencement of Test match cricket as we know it". Only the second five-match series, it demonstrated to the full the almost operatic possibilities of the format, as England won the first two Tests, Australia took the next two and England won the last, but only after chasing down nearly 300. Stoddart's contribution was highlighted by his innings of 173 in the first Test, for the next 80 years the best score by an England captain in Australia. The second tour also saw allegations that Stoddart was not the simon-pure amateur he purported to be. These claims were not new, or confined to cricket. Historian Tony Collins has pointed to the 'common knowledge' that Stoddart was paid £200 for the Lions tour and contrasts the wilfully blind eye turned by the game's authorities with its treatment of northern working men caught receiving much smaller sums in the run up to the schism of 1895. And like many great sportsmen he found the adjustment to retirement difficult. His end was desperately sad. Worried by poor health, deteriorating finances and a joyless home life, he shot himself on April 3, 1915. Frith, whose other works include a study of cricketing suicides, has suggested that the manner of his death led to his being for a long time undervalued by posterity. But he was never entirely forgotten. Interviewed in 1948 his Australian-born widow confessed to regret at never having seen Don Bradman play, before adding "But Bradman can't play rugby". And if there is a sporting achievement as unassailable as Bradman's career Test batting average of 99.94, it is probably Stoddart's dual leadership role.